Happy sunny Saturday to you! It has been a bit crazy around here - planning new classes and clubs - meeting with fabric reps - hosting quilt groups - and all the day to day work too!! But we are so excited to bring some fun exciting things starting this Summer! So, here is to a newsletter FULL of some fun info. You know we love when the UPS man comes! 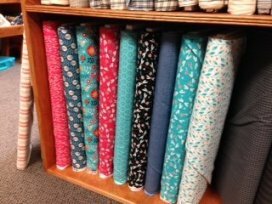 This week he brought us a darling line from Camelot fabrics called Gypsy Lane - and these beautiful coral and teal colors make you want to smile! Check them out! Price includes pattern and fabrics. You have to stop in and see how gorgeous these fabrics are! (The picture doesn't do it justice!) Call us at 308-344-9389 or email us at juststitchin2014@gmail.com if you are interested in joining us! Woolie ladies - we have NEW kits out and NEW patterns from The Woolen Needle! Next Saturday is Woolie Day! Join us in the 3rd floor training room from 10 - 3 to work on your little project. It's a great place to meet new ladies and share some laughter! Lunch will be Loops - so we will decide that day! Join us for a NEW club - STASH BUSTERS CLUB! This group will meet on the 3rd Tuesday evening of each month starting June 17th. Come at 5:30 pm and work on any project you would like! Bust your stash, finish a UFO, or work on something new! For those who join us, you will have the chance to participate in a surprise special each month! I promise - you won't want to miss this! Only 2 spots are left for our Strip Tube Class! Let us know if you want to join in the fun! 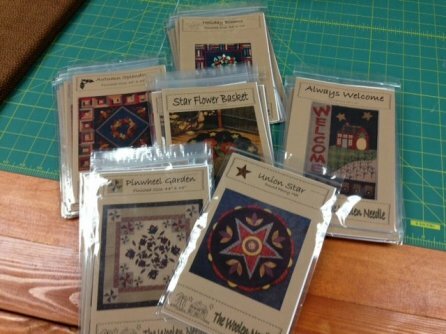 For those who are signed up, please let us know which kit you would like to do: batik or Kim Diehl. 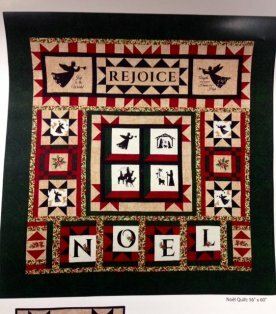 If you are part of quilt group or guild that would like to come to the shop for a demonstration, let us know! We would love to have you! Stay cool friends! I know I will be hanging at my sewing machine downstairs. Have a wonderful weekend!